The groundwater tools are used to perform rudimentary advection–dispersion modeling of constituents in groundwater. The following are sample applications using the tools. In the following image, Porous Puff and Particle Track were used to examine the distribution and track of a contaminant. 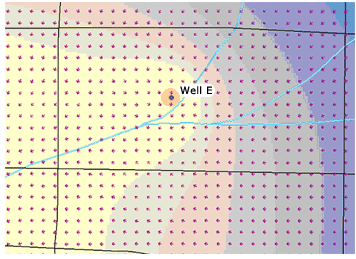 The following image demonstrates tracking particles from a contaminant spill to a pumping well using the Particle Track tool. From this analysis, you can determine whether the contaminant is getting into the drinking water for a nearby town. 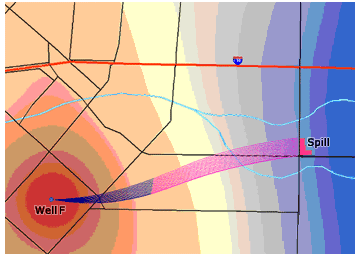 In the following image, the flow direction of the groundwater is determined using the Darcy Flow and Darcy Velocity tools to understand how a contaminant will move through the groundwater.